This galvanised shelf for a META bolted system with a shelf load of up to 80 kg enables you to store even more lightweight goods. 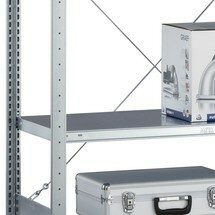 The shelf is made from a high-quality steel plate with a 3-point safety edge and it remains stable even under load. 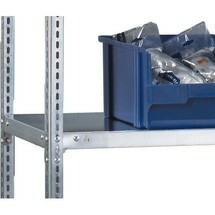 The shelf for a META bolted system with a shelf load of up to 100 kg is suitable for the storage of light goods. It is manufactured from high-quality steel plate which retains its form under load.